If you are hosting a dinosaur birthday party, then this Dinosaur-themed version of the classic Trouble board game is a perfect idea. You can even give it as a prize for a game — it’s very affordable. The classic pop-o-matic style gameplay you remember, with a new twist. It scored five stars on Amazon! See more Trouble board games here. 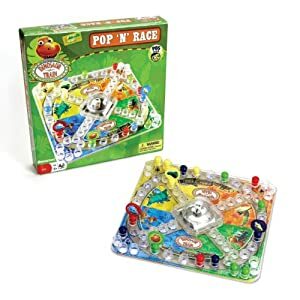 If you own Game of Trouble: Dinosaur Pop and Race, please rate it by clicking on the Comments link below the eBay listings.